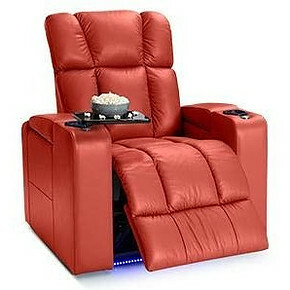 You could make a case that we are moving in a very fact paced direction with the revolution of home theater technology. It’s amazing to know that its so many options on the table for theater entertainment. 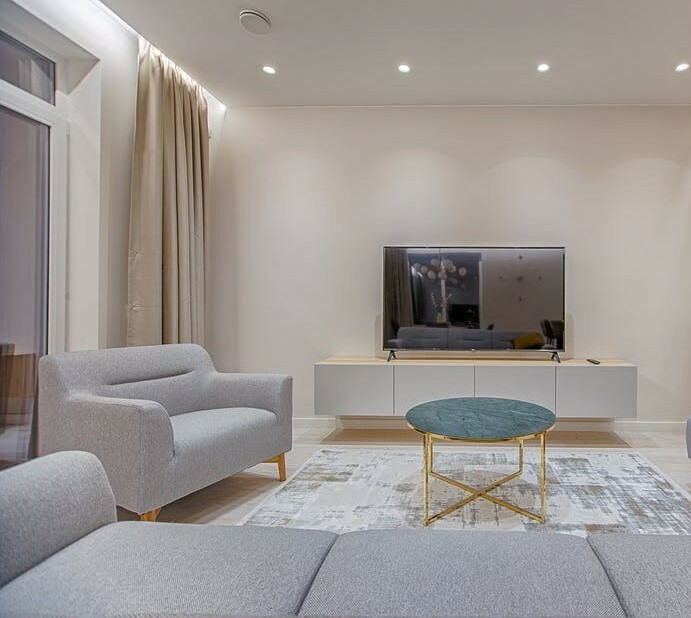 You have many features in technology from living room settings to basement designs its more than just plug and play but at the same time you would like to have the same simplistic ideas to make it easier to use and operate. In order to surround your home with great entertainment and wireless sound, there needs to be a clear idea as to what do you want out of your room. To help you get a better perspective, It’s wise to have a list of things you want and a reasonable budget to work with. Measure your room sizes to determine what type of furniture and technology your bring in the room. Decide what type theme you want for this room for example: Game Room, Theater Room, Reading, Or ManCave. How many people do you plan on having in your room? This is important for quality and size accommodations. How much light lighting or less furniture are you using to complete the room. It’s a good time to write down these ideas to get more information of what do you really want in the long run. Knowing the difference between building a theater room and creating a dazzling opportunity to enjoy a long time. Can you see your creative thoughts begin to formulate a great scheme of wonderful features and fine theater options? well if you not don’t worry there are more things were going to introduce to those who are looking to go for beyond the normal look and style of the best sets by exploring totally new and fun ways to design your theater room. What Entertainment Makes you Think Outside The Box? To really understand this, It’s best to get a better perspective by reading and using good visual options for better creation tactics. Sometimes it can just take a simple speaker or two make your living room glisten and shine. Or a great wall paper could turn the tide of what your people could expect in this arrangement of speakers and lighting and good screen action that makes your home stand out from the rest. But remember to always have this setup in place to build off your personal taste and style. Its more than entertainment that helps inspire you to build a wonderful room of technology and luxury, its how you display things in the home which makes it more appealing to see and experience to those who see it for the first time. To shed some light on this, let’s take for instance, what type of seating we are looking for that will make you movie theater seating experience a one to truly enjoy and have fun with. You could display the seating in a movie theater like way or make the whole room totally comfortable by face them in random or facing positions while your screening is set to show up on the ceiling this will give you an opportunity to recline and catch up on the sitcoms while resting in a better position. Let’s look at some the best seating options you could have in a theater room to use. Homall Single Theater Recliners: It’s amazon’s bestseller for reason. Sturdy clean, sleek, affordable and durable for the long run. It’s know that in order to enjoy a great movie you have to make sure the recliner can deliver on a day to day bases. Two times the comfort by the arm rest and back rest. Clean up is a sinch if your spilling drinks on this recliner made to resist most liquids and some of the worst spills you can think of. The footrest action is double in foam support as well. This ensures your more than able to have a good sense of comfort and stability which keeps you mind focused on the action and not back aches. Diesel XS950 two Seating Recliners: This set has some the best top grain leather that is so smooth to the touch which makes them a high likable piece to enjoy for long extended periods of time. You got to check out the illuminated cup holders It’s one of those gem features to have. The ports on the side of the chair makes the changing your devices a snap by illuminating the ports for easier to find connection. The best part is the reclining in smaller areas to fit to your lifestyle. Wall away design is revolutionary, It’s helpful for the tightest areas that require less space to operate and recline in full stride. This to me has the makings of a perfect love seat recliner that delivers excellent quality for great performance. Octane Turbo XL700 Three seating Recliners: A true relaxing set of recliners full of great options and sweet features like good lumbar support plus a large arm compartment for storage. Octane has memory foam installed in the seat cushions, this will give you comfort to relax to. The stainless steel cup holders makes the look wonderful to see plus don’t worry about the spills inside the cup because its removable and dish water safe. Most of us love to have our devices available to use at an arm’s length so octane has cell phone, tablet, and a handy flex LED light for dark places to plug into. Clean simple look which is great to know this set can blend in with most living room features and styles, what your going to love about this furniture set is the LED lighting which makes it most appealing, Octane has build a theater seat that meets the needs of the consumer and delivered on quality and comfort. Make sense to build out your sound system to cover the high quality action sequence a movie may need to display and preform under? Many of us get rob by the low quality experience of listening to regular speaker support and low preforming bass speakers that may not have the same high definition and crisp contrast you need the most out of a late model speaker set. There is hope to know that we found some the best lines of speakers that will give you what you need out of a surround sound system. Not all surround systems have high priced tags, if could take a great number of tries on the open market to find that special one for your self but its safe to say these we have here will give you more confidence to really make the decision on what surround sound system fits your needs most. It’s one the superior acoustic sounds that uses a form or technology called IMG Injection Mold Graphite Which help delivers a premium sound though out your home. Imagine a world where you can see and hear what is going on in real time that could bring in more than enough quality performance which will capture the all forms of sounds a movie can produce. Kilpsch has a way with speakers systems, This feature they call Tractrix Horn Technology is responsible for bring the sound to real time action and good imaging which can develop some the best types of clean and pure natural sound. Wireless Subwoofer Has more than just a wireless effect, it can be used in different rooms without take up too much space. Even though the Subwoofer its self is small the amount of low end bass helps deliver a floor banging plus which creates a world of sound around your ares and room space. Forget about those clumsy stands that has too many cords around the TV set when you have a mounting speak that could get you to the best part of the movie theater without the sticky floors and annoy crying babies to interrupt. It’ 1/4inch by 20 keyhole space which allows for easy setup and mounting. This is a great sound bar, Bose is really focused on become the best in sound bar entertainment today. Does this mean that its features are top of the line well it should but you be the judge and check what is so special about its sound bar king. The clear voice pickup is great when your into the movie and want to speak to the set with screaming or turn the sound down to give instructions while interrupting others enjoyment. The light bar in front of the set can give you indicators when alexa is thinking or listening to your commands. You could really get the idea that its safe to use the ports for connective and less to no distortion and turbulence by placing a screen over the ports which could kill the sound quality its self. The sound speakers can produce multi directional sound for greater space and phenomenal placement for high performance what you can find out about this model is the voice command feature which can check the weather and news updates, play your music when you need it most, plus if your tired of barking commands it has a voice command to turn this feature off with only your voice recognition. These are some the many ways you can surround your home with great entertainment and great theater sound, but were very interested in getting to know more about your own home theater ideas or maybe you have some new ways to share them with us. Please comment below if your have any questions or concerns about this article. Are you looking to improve your home entertainment with the best devices and features you could fully enjoy for years to come? well it’s a good thing you came to the right place to find out ways to take your living room to another level. In this article were going to take a look at new devices that will make you living room transform into a theater of fun and enjoyment. It’s all about what you need to complete this room with great entertainment and wireless sound. But what does it really take to set up a home theater with wireless sound? Let’s first take a look at some of the best forms of home theater to give you a better understanding how things work in the world of wireless technology. 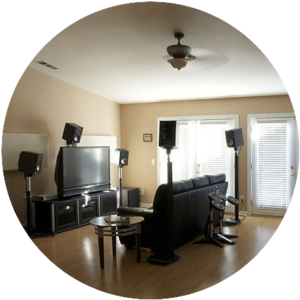 I could not stress how important it is to have a wireless surround sound system in your home. These type of devices can not only save you space, some of these can actually save you on energy cost and the use of extra cords as well. I love the way some of these surround sound devices can enable you to fully enjoy a movie and listen to other devices which you can connect without the mess of cords and cables getting in the way. Most of us hate to get involved with installations and complicated instructions to translate. If your wondering what is the best surround sound system to use, There is a few options to use that will really change the game in terms of home entertainment. This is one Amazon’s best-sellers which means it’s one the best in the market. 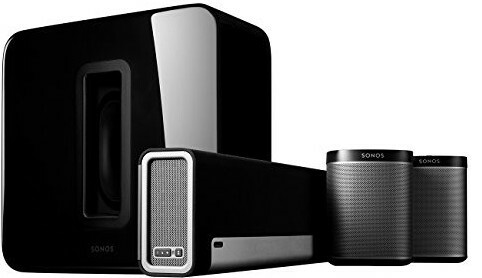 It has a 4 out 5 stars and seems to be a very high pick choice for home theater sound. This is also a 5.1 theater sound device. Sub-woofer System: This speaker will not only make you hear the excitement and action but also feel the power of 75 amps pumping into the room while your getting into music or movies. What you will love about this sub-woofer is the low rumble which will make your gaming and movie experience more intense. Full control over the sound: Having full access to surround sound feels like your in the drivers seat. Being able to tune movies, music and gaming sound to get the window rattling sound is amazing to feel. 3D surround sound: this means richer, crisp and high definition sound coming at you from different angles. This is great for music, and movies. Try watching a good horror flick at night in the dark with these 2 channel speakers open and carrying low bass sound. Plug and Play Setup: It’s known that people simply love to hook up surround sound devices to get the best secured connections. Well Logitech makes it easier for the most novice person to connect devices and TV cables to this system with little to no hassle at all. Its easy connections for wired hook ups. Logitech home theater surround sound system helps you get the most out of your home entertainment setup with features that is second to none. There is so much to love about this sound system. You can really enjoy the powerfully dominant sound acoustics which can deliver great sound quality at the same time saves you space. You’re living room will be filled with theater sound or music when these speakers are on and performing at peak levels, so it’s good to be in good company when you choose to watch a scary movie while this sound system is active. Only exclusive to Kilpsch, There is a feature called Tractrix Horn technology and aluminum tweeters makes this operation wonderful to listen to by the way of using a cleaner more natural sound quality you have ever heard of. Flexible Placement: Using a 1/4 x 20 threaded inserts You can have the option to mount your speakers anywhere around the room. The center channel speaker keyhole has two inserts for great mounting support. Cinematic Performance: Imagine having Injection Molded Graphite Woofers(IMG) for supreme sound control with the distortion and topping it off with a premium LTS Lenar Travel Suspension for low distortion and enhanced performance. Wireless Sub-woofer: This is the best feature to have in my opinion, To have a low bass frequency system filling your room with clean crisp sound quality is like putting the cherry on top of your sound support. This Sub take up little space and has a built in all digital amplifier that creates CD-quality sound from anywhere in the room. If You have a good sound system for quality sound, you have to check out a good portable projector with great compatible options. Projectors have so many ways to display enjoyment nowadays, but know in mind what type of things is needed to fully suit the needs that you may have Not every projector can deliver on every need. Some are for specific functions and others can only be made for certain things. phenomenal Viewing Experience: Just imagine the wonderful world of blazing colors and high definition technology when you turn on this projector. I love the way things work with this portable projector. You get to view things under MStar upgraded mechanisms to fully enjoy movie watching under great detail. Upgraded LED lighting: Projects 40 times brighter than the average projector. That’s right, your get 1920×1080 resolution and 2000:1 contrast ration for ideal home entertainment. Multi-media Vankyo Projector: Hook up all of your favorite devices to this projector. Stream TV shows, play video games like XBOX ONE, PS3,PS4, Wii and others to this set and enjoy it using your smartphone by casting it. If your looking to take it on the go you also get a small carry on bag for travel or storage. Get The Big Screen Experience: With 32″ to 176″ projection that delivers huge screen displays and if your looking to adjust the size to accommodate your personal needs it’s okay the projector adjust the quality to bring the same amazing content without taking away from the quality. Fan Noise Cut Down: No more loud crazy buzzing sounds to distract you from the entertainment. Vankyo has cut this down in half thanks to new engineered ventilation and proper heat dispersion tactics which helps in keeping the system cooled while your listening to nothing but qaulity sound from your home theater. 3-Year Warranty: Vankyo Has a rock solid grantee to back its projector. You don’t have to worry about getting some problems with this machine because it also has 24 hour customer support system to answer your most difficult questions. If your not satisfied with this system, you can get your money back 100% as long as it’s under the 3-year time frame. If you have no speaker system to use, rest assured Vankyo has a built in speaker to get full amazing entertainment with premium sound performance. Vankyo mini projector is rated by Amazon as it’s best choice to buy. If you think this machine cost you tons, guess again Amazon has the best price for a Vankyo portable projector. You can realize the difference between a high quality sound bars and your average speaker system. It’s no wonder why people are buying more sound bars to complete the viewing by cutting down on space, money and extra wires. But you can have all in one with a wireless sound bar for your TV set. Let’s examine this more by looking at one of the world best sounds bars for cost saving options and great convince. Premium Sound with powerful bass makes this a wonderful combination for sound quality entertainment. This system fits’ great for 42″ inch TVs. You can feel the beast of sound rumbling though your bones when this system is fully active and operating at a full tilt. 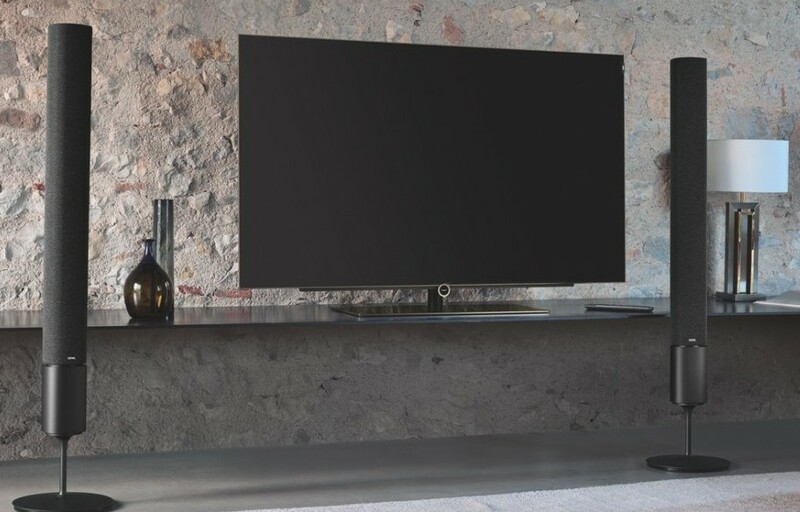 The power of Bluetooth makes it easy to connect to your TV set and play your favorite movies, music and video games, though the best sound bar to ever make things easy, simple and wonderful. To understand this more we are going to look at more features to use for your home. 2.1 Sound Bar System: That’s two speakers in one with a paired sub-woofer that delivers more than enough sound amazement to take your experience to another level. Crystal clear audio, and booming sound helps makes your viewing so real your wanting more than it’s expected. Expansive Audio System: You get the power of 95 decibels to create a room filled with crystal clear sound performance. With this feature activated in your home,trust the process to know that Vizio has less than 1 % of the distortion coming though these speakers which brings an optimal performance of entertainment. Wireless Subwoofer: You can feel real power of this sub blasting you from different areas of the room. This sub-woofer can deliver rich bass that’s almost unheard-of in todays market. Just know in mind there are no wired connections with the main sound bar it’s self, so your able to place this smaller sub anywhere around the room for the best type of sound quality when you need it most. The two best features That worth looking into is streaming to your mobile device that allows you to have full control of the music with a push of a button from anywhere in the house. The last thing you should take notice of is the price of Vizio’s sound bar which is mind blowing to check out, I would highly recommend this to those who need to save money to create a home theater for entertainment. There is so many TVs out there nowadays you have the luxury of knowing when a new sale for one comes out. But we all can’t help our selves to see what’s the new sleek stylish high tech Television coming out that will set it apart from the rest. You have to take into account of the type of TV set you need to complete this home theater system. In that in mind, let’s look at a one flat screen that will keep you on the edge of your seat for more entertainment while delivering what you need most out a TV set. 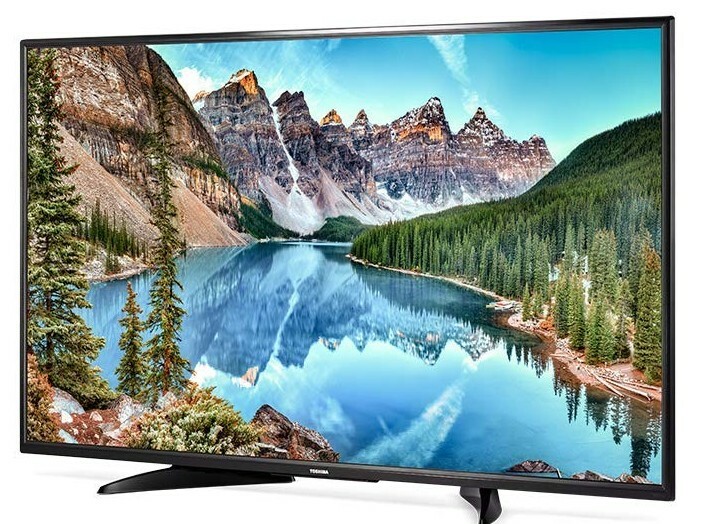 HD resolution has made your viewing experience discover more ways to see color dominance which covers more than just your average flat screen has. Take notice of the lifelike contrast with crystal clarity high definition. This alone takes you to new levels of amazement. Vibrant Color Scheme: Rich colors splash across the screen with explosive design and performance that has made it possible though a feature called Triluminos display which helps in Super bit mapping abilities with 4K and HDR quality. Catch The Action On Screen: Don’t miss a single frame with this feature, See every motion in action without the hassles of Motion blur to help keep you attention while not losing sight of the important scenes. Genius TV: This feature can make your listening devices connect so easily and I love the way Amazon’s alexa and Google home can interact with the TV set for total control environment from wireless technology. A Smart remote, batteries, One Power cord, IR Blaster, instructions, Setup guide and stand is included with this so you can rest reassured this set will not leave you looking for addition accessories to complete the setup. You could argue that is one the most asked questions or discussions to have regarding some of the most beautiful stylish brands to ever grace the TV market. Most people prefer to have a larger set than most because your getting the most out of life with a bigger device. But that is not the case. Many of us have found that some the best things come in small packages which can deliver more than a titan tron of flat screens could offer. We just covered some of them here with features that is out this world. I would like for you tell me what is your take on this topic by explaining in details why would you prefer either one. Also tell me what do you think could be your ideal home theater to surround your home with great entertainment and wireless sound.